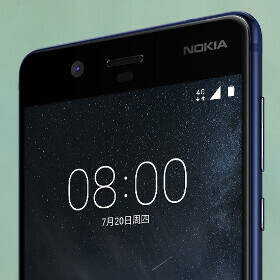 Expected to be officially announced at the end of this month, on July 31, the Nokia 8 will (probably) become the very first high-end Nokia smartphone since the brand has been resurrected. While HMD Global and Nokia haven't confirmed anything about the upcoming handset, we've already seen renders allegedly showing it. What's more, it looks like today, for a brief period of time, Nokia inadvertently listed the new smartphone on its official Chinese website. Right now, there's no mention of the Nokia 8 on Nokia's Chinese website, but some fans say the handset was definitely spotted there, and there's a screenshot (seen below) to prove it. As previously reported, the Nokia 8 looks a lot like the Nokia 6 - at least when viewed from the front, where we can see a fingerprint scanner, plus pretty thick bezels at the top and bottom. The rear of the Nokia 8 should be pretty different, though, allegedly hosting a Zeiss-branded dual camera. On the inside, the Nokia 8 is expected to pack a Qualcomm Snapdragon 835 processor, 4 GB or 6 GB of RAM, and 64 GB of internal memory. Alongside a Quad HD (1440 x 2560 pixels) display of 5.3 inches - or maybe more - these features should make the Nokia a pretty attractive smartphone. It's said that the Nokia 8 will be available in multiple color variants, including blue, silver, gold blue, and gold copper. The new handset should run Android 7.1 Nougat out of the box, and might cost less than $600 unlocked. Now, all we have to do is wait for HMD and Nokia to finally announce the device. "What's more, it looks like today, for a brief period of time, Nokia inadvertently listed the new smartphone on its official Chinese website" Yeah, just like how some articles posted on PA gets taken down few minutes later... I've seen it many times. Is it the same glitch as the Nokia 8 being listed on their website for brief period of time? Harsh but so true lol. Seems like Nokia will do well if they price their phones right and keep Android as clean as it supposed to be. Hoping for more variation though. That plastic back looks cheap and ugly. Maybe in hand is a different story.